That is effectively a daily inflation rate of 98.0. Roughly every day, prices would double. It was also a time of real hardship and poverty, with an unemployment rate of close to 80% and a virtual breakdown in normal economic activity. The hyper-inflation was caused by printing money in response to a series of economic shocks. Price controls which exacerbate shortages. Lack of confidence in government, economy and political life. In the late 1990s, the Zimbabwe government introduced a series of land reforms. This involved redistributing land from the existing white farmers to black farmers. But, with little experience, the new farmers struggled to produce food, and there was a large fall in food production. The economy experienced a sharp fall in output (both agricultural and manufacturing), and this caused a collapse in bank lending. The government began increasing the rate at which they were printing money and increasing the money supply. This started with printing money to finance a war in the Congo and also to increase salaries of officials and soldiers. But, as the economic crises worsened, printing money became a very short-term solution to try and placate people relying on government pay. With the economy in decline, government debt increased. To finance the higher debt, the government responded by printing more money, which caused more inflation. Inflation meant bondholders saw a fall in the value of their bonds and so it was hard to sell future debt. The economy also experienced many shortages of goods. Due to the decline in output, there were shortages of goods, which pushes prices up. Nominal demand was rising because people had more paper money. This combination of more money chasing fewer goods caused very rapid rises in price. When there is a shortage – prices rise. Combined with printing more money and this shortage of actual goods, prices rose rapidly. Ironically, this shortage of supply was made worse by the imposition of price controls. Price controls set the price for basic goods (the idea was to keep prices affordable and stop inflation). But, because the cost of production increased faster than prices, suppliers had little incentive to supply the goods (at least through the official channels). This made the shortage worse and the actual inflation worse. 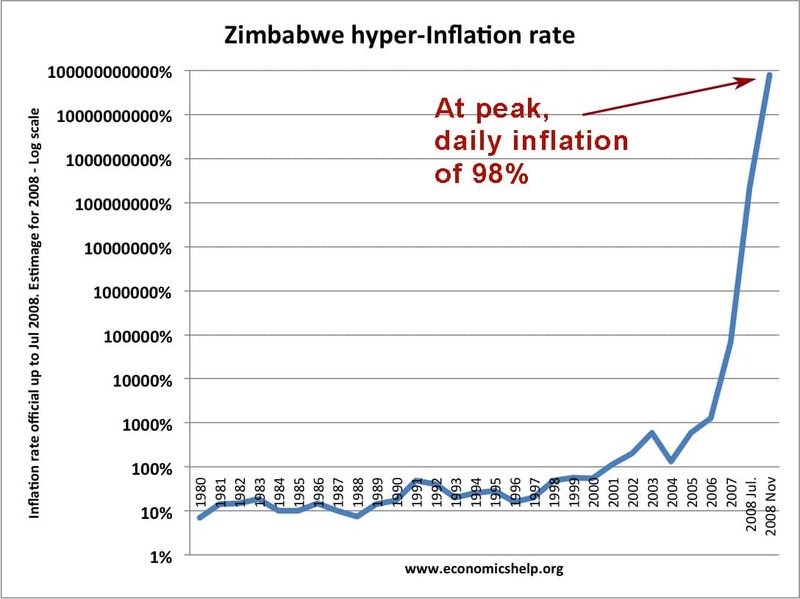 Zimbabwe had high inflation since the mid-1960s. People became accustomed to expecting more inflation. This then becomes self-fulfilling. If people expect hyperinflation, they demand higher wages and push up prices in anticipation of higher inflation in future. I promise to pay the bearer on demand $100 trillion! I wonder if anyone tried going to the central bank and demanding the $100 trillion in gold. People couldn’t afford basic goods. Zimbabwe had the worst of both worlds – prices rising faster than wages and incomes. People became “poverty billionaires’ It was no good having a salary of One billion dollars if a loaf of bread cost two billion. No credit available. The entire financial system became undermined, banks closed and were unwilling to lend any money. Due to rising prices, the value of debt could be soon wiped out. But, this meant business and individuals had no access to credit. Normal business activity closed down and investment was cut back. Menu costs. With inflation almost doubling through the day, anyone who received money had to exchange into foreign currency or spend straight away. Bus commutes were one price in the morning, and much more expensive on the way back. 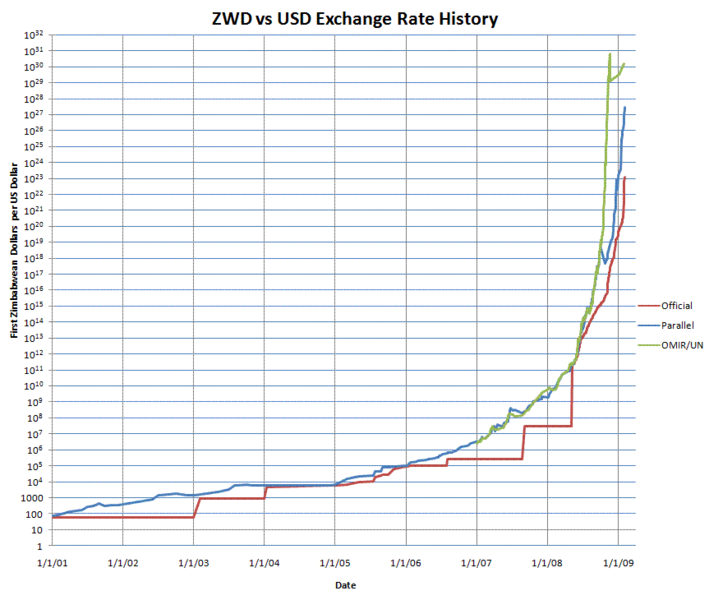 People had to spend time adjusting prices, but more importantly get rid of Zimbabwean currency as soon as you received it. Switch to a barter economy. With money becoming worthless, people found ways around the official economy, paying for goods in kind (e.g. using agricultural produce to get a haircut) The problem is the barter economy is only useful if you have goods to exchange. Business increasingly switched to the use of foreign currency – the US dollar as the only way to survive inflation. In 2009, this practice became more widespread. Lost savings. Anyone with savings lost everything – unless they were able to exchange with foreign currency. Even people with assets and property often saw the value shrink. Foreign exchange controls make it very hard to take money out of the country. Damage to business confidence. The extent of hyperinflation and fall in output disrupted normal economic activity and saw Zimbabwe GDP shrink. It affects investors for a long time. The government eventually stopped printing Zimbabwe dollars and normalised the practice of using the US dollar. 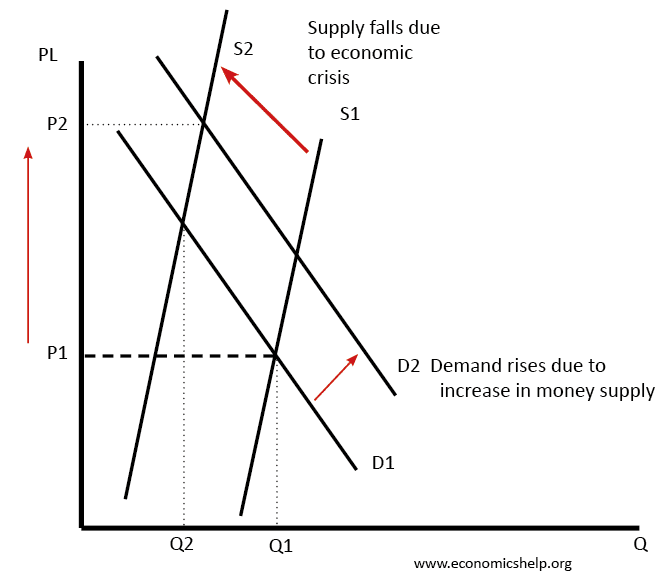 Usually, in the West, inflation is caused during periods of rapid growth; it is termed demand-pull inflation. However, this particular case of inflation is not caused by an economic boom, but, a collapse in the economy where the money supply is growing despite a fall in output and number of goods available. Basically, even if only a small % of the population has any money that is sufficient to cause inflation if the output is falling. The real problem is that many people have more cash/money, but have declining real incomes. ← Do we need economic growth in a modern economy?